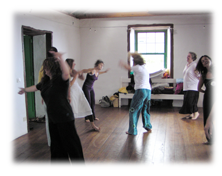 Taking place once a month (except in August), Happy Feet provides an open space for free dancing, dance and contact improvisation, and experimenting with encounters. 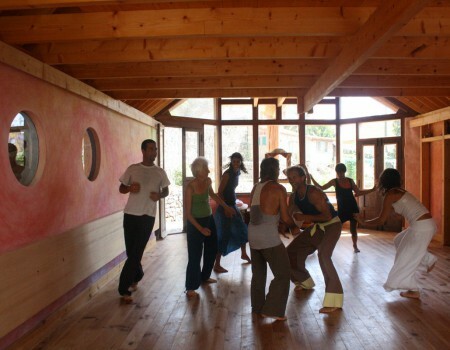 We dance with bare feet (or in socks / light gym shoes) in a room about 250m² big with wooden floor. It is light enough for us to see and encounter each other. The event is non-smoking and without alcohol consumption. 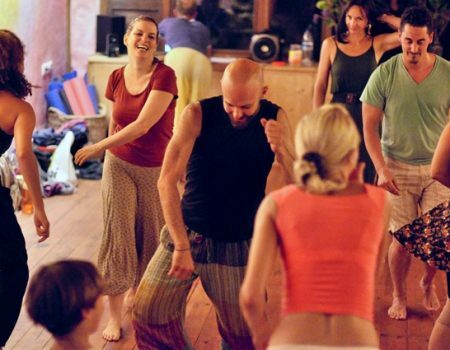 Happy Feet is the place to completely let yourself go in dancing, express yourself in uncounted different ways, and have encounters while moving. People at the event are keen on moving to music and enjoy to dance their own style. From heeding the need to be alone for a while to interacting with others – all is welcome. In terms of dancing/movement Happy Feet is one giant „playground“ where just about anything can arise out of a spontaneous move. Usually I (Chetan) guide you through a warm-up from about 7.30 to 8.15pm. This is just an offer, you don’t have to participate. It can help to arrive in your body and your movement and also – especially for newcomers – be a playful path into contact with others. The warm-up turns out a little different every time and combines play with techniques and methods of Creative dance, New Dance, dance and contact improvisation and dance drama. No prior knowledge necessary. After 8.15pm we dance freely; as DJ I play many different kinds of music including ethno, classics, jazz, movie scores… a lot of experimental music as well. Happy Feet is open to everybody. No prior knowledge whatsoever needed. It is also possible to join after the warm-up. Door opens 7pm; warm-up from 7.30 to ca. 8.15pm; last song around 10.45pm. Location: Gym of Waldorf School, Neckarauer Waldweg 131, Mannheim-Neckarau.